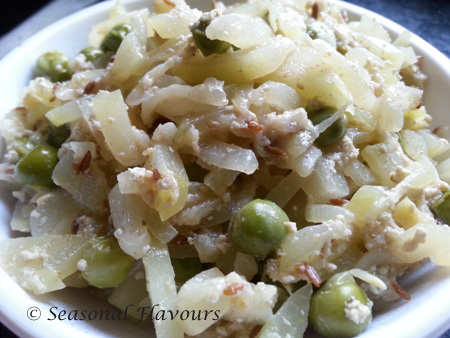 Lau Koraishuti is a simple Bengali dish made with bottle gourd and fresh green peas. Bottle gourd and peas cooked Bengali style is a light refreshing dish with a creamy texture. Bottle gourd or Lauki (Hindi) is known for its high water content and is an excellent weight-loss food. The green vegetable helps fight jaundice, indigestion and fatigue. Dudh Diye Lau recipe combines finely sliced bottle gourd, fresh peas, mild spices and milk. Bottle gourd curry with milk is a Bengali delicacy. 1. To make Lauki Matar, peel and thinly slice the bottle gourd and finely mince the ginger. 2. Heat oil in a pan. Add bay leaf, broken red chilli and cumin seeds. 3. When the cumin seeds start to sizzle, add grated ginger and fry till the raw smell disappears. 4. Put in the bottle gourd and peas. Mix well and sauté for 1-2 minutes. 5. Add cumin powder and salt and combine well. 6. Cook covered for about 10 minutes on medium flame till the bottle gourd is ¾ th cooked, and all the water evaporates. In between, remove the lid and stir well. Water need not be added as the bottle gourd releases a lot of water. (However, if the bottle gourd isn’t fresh, then sprinkle a little water and cook). 7. Add milk and sugar. Blend well and cook dudh diye lau till the bottle gourd turns tender, the peas are cooked and the dish is almost dry. 8. Top with a blob of ghee and serve Bengali Lau Koraishuti as a side dish with Rice and Dal. For more bottle gourd recipes, check out Lau Chingri, Olan Kerala Curry. Lau Koraishuti is a light, sweetish Bengali dish that is both tasty and healthy. 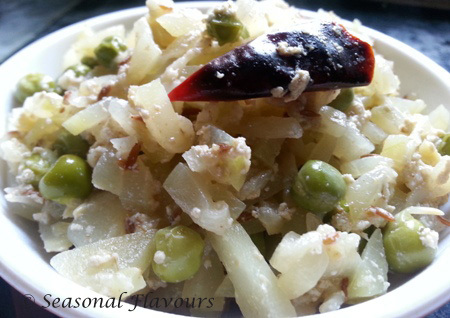 Lau (bottle gourd) and Koraishuti (green peas) are used in combination in this simple fare. To make this bottle gourd milk curry, peel and finely slice the bottle gourd and grate the ginger. Heat oil in a kadai. Toss in bay leaf, dry red chilli and cumin seeds. Stir for a few seconds. Add grated ginger and saute for 15-20 seconds. Mix in the bottle gourd and peas. Sauté for a couple of seconds. Sprinkle jeera powder and salt. Mix well. Cover and cook on medium flame till the bottle gourd is almost done. (No need of adding water). Add milk, sugar and mix well. Simmer on low-medium heat till the bottle gourd and peas are cooked. All the moisture should be well-absorbed. Drizzle some ghee on top and remove. Serve Bengali Lau Koraishuti with Dal-Rice.